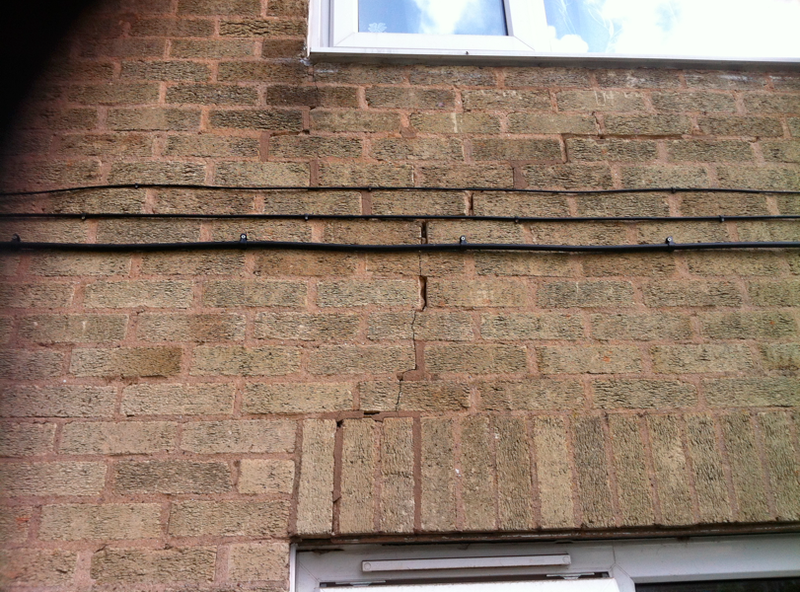 Some time ago I was asked to investigate structural cracking in a large residential scheme in the West Midlands. On visiting the scheme and noting cracks on the building I had a strong suspicion that the building had been constructed in Calcium silicate bricks but it should be noted that there is no definitive site test for identifying Calcium Silicate Bricks; positive identification can only be gained after laboratory analysis, specifically XRD (X-ray diffraction) where peaks in both quartzite and calcite will positively confirm calcium silicate construction. However, a basic understanding of these bricks and their properties can go some way to helping with correct site identification. Since we know there are a number of known problems associated with Calcium Silicate brick construction, it was of primary importance to identify the form of masonry construction. Calcium silicate (sand lime and flint lime) bricks are manufactured by mixing lime, sand and/or crushed silicaceous or flint stone together, with enough water to allow the mixture to be moulded under high pressure. The bricks are then steam autoclaved so that the lime reacts with the silica to form hydrated calcium silicates. Pigments can be added during the mixing stage. In their natural state, calcium silicate bricks are white to a creamy off-white colour, but the addition of ochres (buff or cream colours), iron oxides (pink, red, brown or black) or chrome oxide (green) can enable a very wide variety of colours to be produced. Close inspection of the bricks showed what appeared to be small particles of flint embedded up to 3mm in size. Embedded flint visible and bricks scraped very easily on their surface. This would be consistent with a calcium silicate brick as would the fact that a surface scrape of a brick proved them to be extremely soft. They also have no ‘fireskin’ as would be seen with a clay brick. They are often confused with concrete bricks but these are much harder and would not scrape quite so easily. Finally the factor which swung the balance of probability in favour of calcium silicate bricks was the colour differential below and just above DPC level. Calcium silicate bricks have a propensity for all colour variants to darken quite noticeably when wet. The wetter bricks below DPC level and just above dpc level (where the dpc has been bridged) is noticeably darker. Mortar considerably harder than the masonry units. Loss of protection to movement joints in corners. 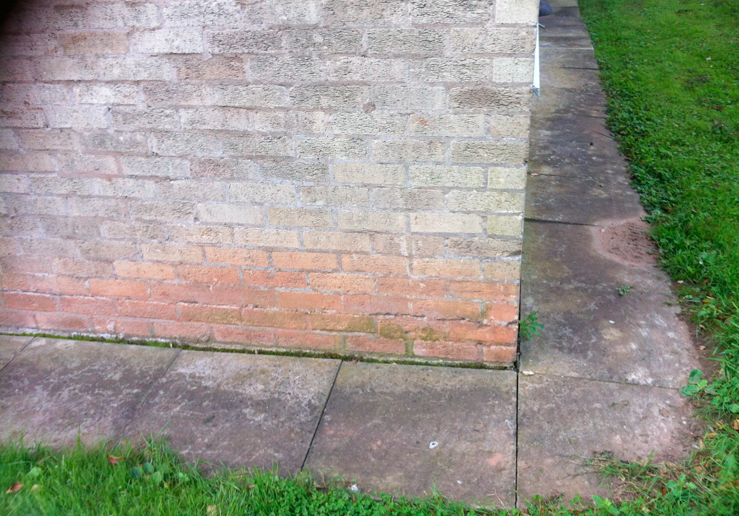 Discolouration of brickwork below and just above dpc level. Oversailing brickwork at DPC level. Regular stepped cracking & poor repair work. DPC slip plane should also have been installed at first floor level. Mortar considerably harder than the masonry units: Not in itself a defect but Calcium silicate bricks are prone to shrinkage or expansion cracks therefore the mortar needs to ‘give’ with brickwork. This isn’t possible where an overly strong OPC mortar mix has been used. 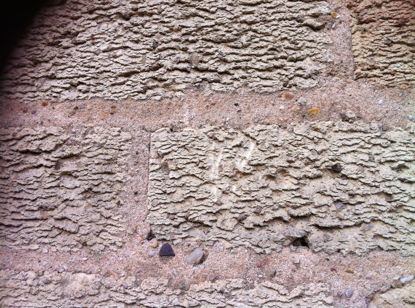 Ideally a lime mortar would be used that would have a similar co-effecient of expansion as the masonry units. The overly strong mix has undoubtedly contributed to the widespread shrinkage crack problem across this scheme. DPC bridged by mortar: This is of course an issue that might give rise to future damp problems but more importantly the dpc forms a very important part of calcium silicate brick construction. The DPC acts as a slip plane for the brickwork above and allows the brickwork above to move in a more controlled manner without cracking. Pointing around the dpc joint only serves to prohibit movement of the slip plane with a danger that uncontrolled shrinkage cracks will occur elsewhere in the building. Regular and consistent stepped shrinkage cracks throughout scheme: I do not believe that these cracks give any cause for concern over and above the fact that repointing is required to improve the aesthetic and to weatherproof open joints. There was nothing to indicate that these cracks are caused by anything other than shrinkage/expansion. Pointing to movement joints in building corners: Movement joints by their very nature are meant to move therefore you do not seal them with mortar against the elements as this is inflexible and will crack and fall out. This is precisely what had happened at this scheme and the mortar fillets should be removed and replaced with a flexible polysulphide mastic. Loss of protection to movement joints in corners: As for point 4 but the replacement of mortar with sealant will re-instate weather protection to the movement joint. Oversailing brickwork at DPC level: Worthy of mention but not in my opinion really a defect on this form of construction; it simply demonstrates that the slip plane at dpc level is acting as intended in certain areas. Compressible fibreboard movement joint installed but prevented from functioning as intended by hard cement mortar. Joint should be sealed with flexible mastic. Thermal movement is likely to be about 1.5 times that of clay brickwork. Calcium silicate brickwork, unlike clay, usually undergoes an initial irreversible shrinkage on laying (clay brickwork tends to expand) but so long as the propensity for movement is understood and catered for in the design, there is no reason why the brickwork should not perform adequately. 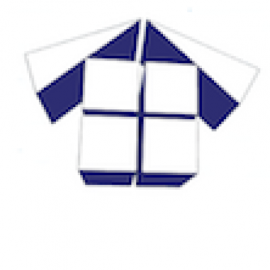 Often this factor is not catered for in the design and this results in widespread cracking. Calcium silicate bricks should not be used in solid work with clay facings or backings, this is because of the propensity of the bricks to shrink in contrast with the expansion of clay brickwork. If solid walling is to be contemplated, backings of concrete bricks or blocks should be used, as these have similar movement characteristics to calcium silicate bricks. We often see an inappropriate choice of walling material for the inner leaf and this sets up opposing forces due to differential expansion, again resulting in widespread cracking. General construction detailing is often not attended to, particularly with regard to providing sufficient flexibility in the wall ties to permit the differential movements and allowing for discontinuity around cavity closers to prevent cracking. 4. The requirement for inbuilt slip planes is often not attended to. Internally, walls of calcium silicate brickwork need to be bedded on a damp proof course to act as a slip plane and so facilitate longitudinal movements to occur – this would be equally necessary at upper floor levels, a detail that had been missed at this scheme. 5. Movement control in walling is not the only issue – also consider building elements that could provide a restraining influence. For example, concrete columns or walls cast up against bricks should be avoided unless a slip membrane can be provided. – as should any form of construction that will prevent free movement. At this scheme pointing of the movement joints and dpc both provide this restraining influence. 6. 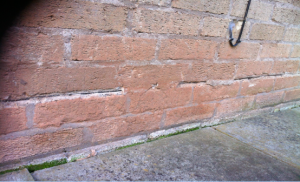 It is not unusual to see some form of displacement with calcium silicate bricks due to thermal expansion, for example brickwork sliding off a damp proof course, cracking at corners or evident disruption. By contrast, shrinkage cracking does not generally produce these manifestations. DPC pointed over but movement across DPC slip plane has caused mortar failure and so reinstated the natural slip plane function. Calcium silicate bricks are often given a bad press due to the issues highlighted here; however it should be said that they are an excellent building material so long as the construction detailing required to deal with shrinkage or expansion is understood. Unfortunately more often than not this detailing is not understood and buildings are generally constructed in the same fashion as would clay bricks. They outperform clay bricks in some respects, particularly with regard to frost resistance. The question for this particular scheme is whether the construction detailing was so bad as to cause significant concern for the long term future or viability of these blocks? In my view there were no significant concerns; the blocks are structurally sound and the cracking should be attended to as an aesthetic detail. The quality of previous pointing has been quite poor and this has to a degree scarred the blocks with unsightly or inappropriate work and there is little that can be done to reverse this damage. The pointing should be removed from the dpc to enable it to act as a slip plane and to stop the damp rising above dpc level. Additionally the vertical movement joints in the corners of the blocks should have the restraining mortar fillet removed and then be sealed appropriately with a high quality polysulphide mastic. There is little that can be done with regard to the colour differential around dpc level but then this is purely aesthetic and it is a subjective view as to whether individuals like or dislike this colour change. 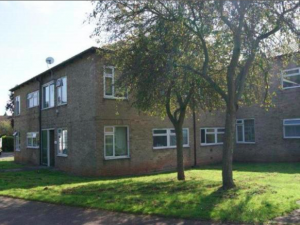 In general terms I saw no reason why these blocks should not continue to provide accomodation for another 40-50 years given nothing more than reasonable maintenance attendance and costs. What additional or reduced requirements are required in the design of movement joints for calcium silicate and concrete bricks as opposed to clay bricks. How much more does bed joint reinforcement reduce the spacing of movement jointsnin calcium silicate and concrete brickwork. Why use calcium silicate or concrete bricks rather than clay other than the improved frost resistance? There’s a lot of detail required to answer your questions Gary but it has prompted me to write a blog about movement joints, which I’ll do over the next few weeks. You will find it extremely difficult to locate specific design principles relating to the requirement for movement joints in calcium silicate brickwork. However there are some basic considerations that are widely accepted but ultimately it is the designers responsibility to ensure that movement joints are suitable for the structure in the question; as an architect I’m guessing you understand this and perhaps this forms some of the basis for the question? 1. Firstly you need to understand that the DPC acts as a slip plane as well as a DPC but you further need to understand that a slip plane (DPC) needs installing at every floor level. The DPC is placed on a full bed of mortar minimum of 6mm thick. The DPC should be of the type that has good adhesion with mortar. The next layer of mortar above is also a full bed of mortar and the DPC is sandwiched between two beds of mortar. It is not possible to install a DPC slip plane unless the mortar joint is a minimum of 13mm wide. The DPC thereby acts as a slip play allowing the wall to move differently in different positions. The DPC should protrude slightly from the finished a joint, so that the visible effects of the DPC are seen. 2. Movement joints should be placed alternately in the brickwork outer leaf and blockwork inner leaf to relieve stresses as the opposing walls both contract and expand alternately. In simple terms the MJ’s should not be facing each other at the inner and outer wall. 3. Consider whether you need to use debonded sliding wall ties. 4. For most bricks, the general industry advice of 1.33mm per linear metre run of brickwork should be followed. This advice is deemed to satisfy and a designer can rely on this as being a good failsafe option. For a maximum distance between movement joints in straight run of brickwork 12m this means one would have a movement joint of 16mm wide. For this reason many designers choose to put movement joints in at between 7 and 8m allowing for a 10 meter movement joint. 5. Ultimately you should refer to manufacturers guidance relating to the expansion characteristics of the bricks used and adjust the movement joints principles outlined in point 4 to suit. 6. I’m unsure what you mean by bed joint reinforcement Gary? There is no simple answer to your last question. Why use any other form of construction material? Calcium silicate bricks were often cheaper than clay bricks and that is probably reason enough for most and as I said they actually have improved frost protection. Sadly builders commonly failed to recognise that they were not laying clay bricks and movement joint design was rarely considered. As a result they have gained a chequered reputation, somewhat unfairly in my view. If the outer skin of the cavity wall was indeed constructed in silica bricks, would you consider this type of construction suitable for C.W.I. Or E.W.I.. The building is also in a very exposed location, close to the coast. Would value your opinion on this. The decision would not be based on whether or not the bricks are calcium silicate. For a wall to be considered suitable for CWI, it needs a minimum 50mm cavity if that CWI is to meet BBA approval. However, a 50mm cavity is often not really a 50mm cavity due to mortar that extrudes into the cavity from the bed and perp joints. These solid extrusions of mortar will significantly reduce the width of cavity and prevent you getting the full 50mm of CWI; therefore it’s not worth doing. If a cavity of 60mm or more exists then you should seriously consider CWI if in all other respects there are no issues with the external building facade. CWI should be bonded polystyrene beads and not blown fibre. If a decision is taken to install EWI over calcium silicate bricks then those bricks should have movement joints installed to deal with the thermal expansion and contraction discussed in this blog. 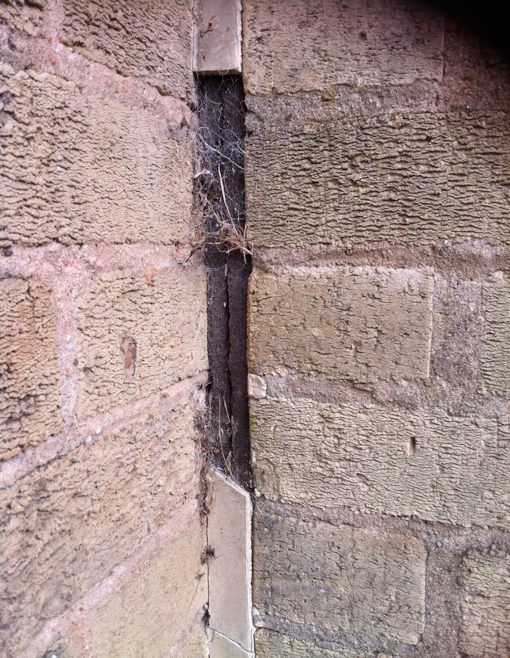 If brickwork is cracked then clearly the expansion joints have been omitted or under specified. Where movement joints do exist then these must be replicated and mirrored in the EWI system otherwise underlying movement in the calcium silicate bricks will cause cracking and failure of the EWI system. I hope that clarifies things? To further clarify your point on exposure… this isn’t a subjective issue Barbara. Often it is claimed that buildings are exposed but if you check exposure charts they are not. 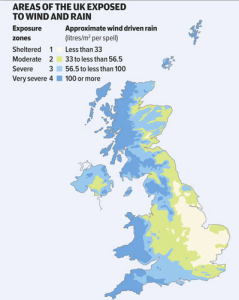 The concern here is based on the BRE’s comments that rainwater can penetrate outer brickwork when in exposed locations and of course since blown fibre CWI is not inherently waterproof then this can cause internal damp. Blown poly beads are inherently waterproof so we just don’t see the problems that we see with blown fibre, though even these problems are far rarer than some would have us believe. Sadly there’s an industry springing up to deal with this ‘major’ problem when in fact we believe it to be a minor problem that is being grossly exaggerated. I’ve inserted an exposure chart at the bottom of the blog. So thorough! Great post, man. Thanks for being so in depth without being overcomplicated and overwhelming. This is just what I was looking for.